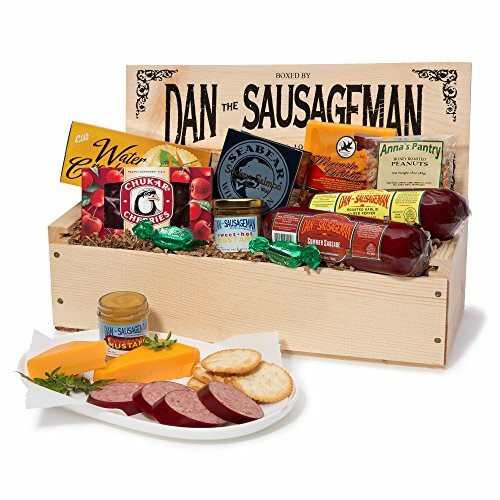 This gift box has all the goodies tucked nicely in a handmade wooden crate, starting with our Original Summer Sausage, Roasted Garlic Red Pepper Summer Sausage, Seabear Smoked Salmon, Wisconsin Cheddar Cheese, Chocolate Covered Cherries, Elki Crackers, Anna's Pantry Peanuts and Dan's very own Sweet Hot Mustard. All foods are shelf stable and ready to eat, making this a perfect gift for any occasion! **Due to weather concerns some foods may be substituted for items of equal or greater value. Let our nearly 30 years of experience help bring great gifts and summer sausage to your friends, family, and businesses!